A while ago I did a sample swab with a pen friend, and Bungubox 4B was one of the samples I got in the swap. 4B stands for the four B's in BunguBox Blue Black. You can find this ink at Vanness Pens. 4B is a dark blue black. In large swabs the ink has a beautiful coppery sheen. Dry time: 15 seconds. This ink has a great dry time for how wet the flow is. Water resistance: Medium-some of the ink washed away but you would probably still be able to read it. 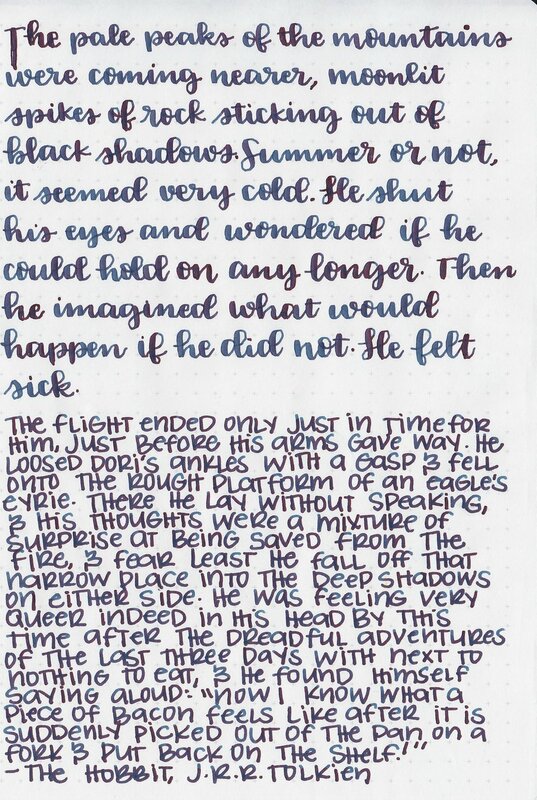 Feathering: Low-the ink feathered a little bit in the flex nib on Rhodia, I think mainly because the ink is so wet. Bleeding: Low-there was some bleeding in the flex nib on Rhodia. Other properties: Low shading, high sheen, and no shimmer. The sheen was visible in all nib sizes on Tomoe River, 3 nib sizes on Leuchtturm, and none on Rhodia. Ink swabs for comparison, left to right (top to bottom for mobile RSS): Rohrer & Klingner Verdigris, Bungubox 4B and Sailor Sei-boku. Click here to see the Bungubox inks together. I used a Pilot 912 with an FA nib then switched to a medium Pelikan M800 Renaissance Brown on Tomoe River paper. The ink had a lovely wet flow. I really like the flow of this ink, but the ink does have a slight chemical smell. Overall, I really like this ink. 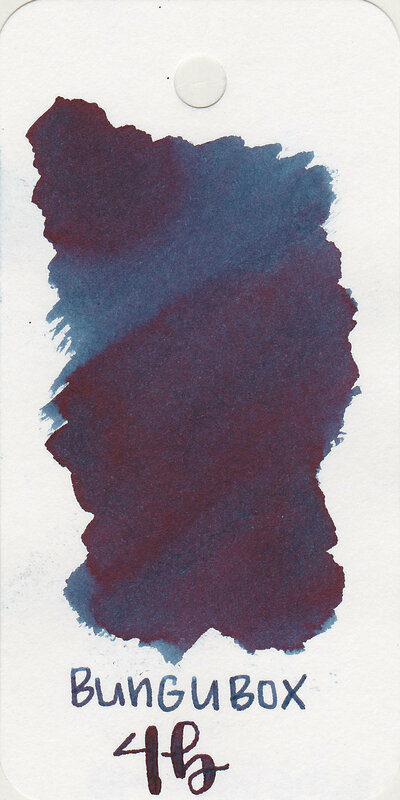 It's an interesting color, dries fast, and has some interesting sheen. Give it a try, you might love it. Disclaimer: I got this ink through a sample swap, and all photos and opinions are my own. There are no affiliate links on this page.